Sally's journey has taken her from the depths of despair to to the pinnacle of an inspirational and awe inspiring ministry that, quite literally, saves lives. From sexual abuse and torture, through the insanity of crime, prison and drug abuse to her eventual liberation, deliverance and emancipation as a highly respected professional lady – The Mother Theresa (or a more gracious version of New York’s Sister Helen) of her city, whose work with her team has touched the lives of thousands of people trapped in addiction and tormented broken lives. 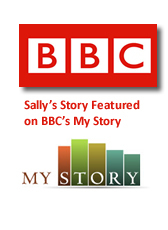 Her story was featured on the BBC's My Story series and she is currently writing her autobiography, a trilogy based on the three inter-connecting stages of her life; and a professional book concerning the undertstanding and treatment of addiction. If you are interested in purchasing any of Sally's books, you may preorder by entering your email address below (no money required...we will notify you when the book is available).